There was just enough snow for a little high-elevation skiing at Loveland Pass this week. 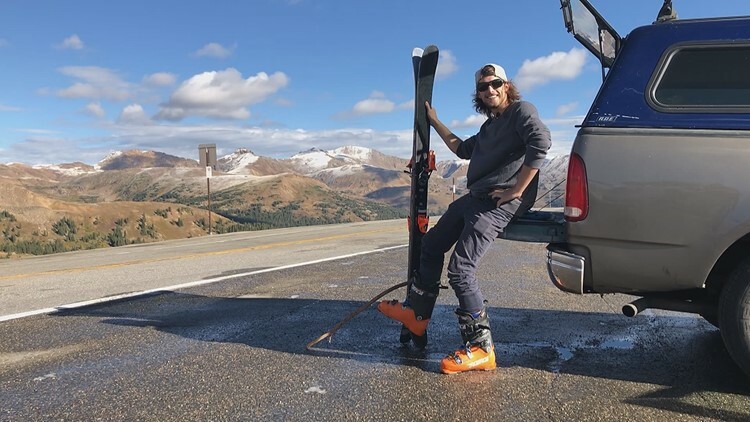 KUSA — Dressed in his Broncos orange ski boots and matching bindings, Pat Astarita has found an opportunity too good to pass. Recent storms brought enough snow at high elevation for some early September skiing high atop Loveland Pass at nearly 12,000 feet. “Just enough floating right over the rocks going left and right,” Astarita said. Picking a small section of mountain, Astarita found a line that didn’t offer the best turns, but turns nonetheless, more than a month before ski areas will officially open. Typically, Arapahoe Basin or Loveland are the first ski area’s in Colorado to open. That usually doesn't happen until mid-October, so getting a September run in is a bonus Astarita grabbed before heading to his next peak.